Help Modryn prove that the Blackwood Company lied about completing a contract to kill Azani Blackheart. Meet with Modryn Oreyn and speak about the Blackwood Company. Travel with Modryn to Arpenia and Atatar. Return Blackheart's ring to Modryn. Modryn Oreyn wants you to meet him at his house after dark to discuss the Blackwood Company. However, you do not actually have to wait till night, as you can talk to Modryn about the Blackwood Company as long as he is in his house. He'll tell you how Vitellus Donton - Vilena Donton's son - was one of fifteen men who died when the Fighters Guild tried to retrieve the sword Sinweaver from Azani Blackheart in order to complete a contract for a mage named Argoth. The Blackwood Company then claimed that they completed the mission instead, simultaneously establishing their reputation as an alternative to the Fighters Guild and making the Fighters Guild look like incompetent cowards. However, Argoth was mysteriously killed shortly afterwards and Sinweaver went missing, leading Modryn to doubt the Blackwood Company's story. He suspects that - despite their claims - the Blackwood Company never killed Azani, but instead made a deal with him: they paid him part of the contract money to get the sword, and then told him where he could find Argoth to take his revenge and retrieve the sword. Modryn wants to investigate the situation, including possibly killing Azani Blackheart to prove that the Blackwood Company lied. If you accept Modryn's dangerous mission, he asks you to meet him at the Fighters Guild in Leyawiin and travel to Arpenia to find out what's going on. He'll mark Arpenia on your map. Once you arrive in Leyawiin, speak with Modryn and he'll accompany you to Arpenia, northeast of Leyawiin in the Blackwood region. Explore a bit then talk to Modryn, who will declare that Azani Blackheart isn't there - in fact, the place is deserted. The quest advance is actually triggered by standing within 200 feet of an invisible map marker (in the northeast room, shown at M on the Arpenia map). If you are having problems advancing the quest, stand at that point for a minute, then try talking to Modryn again. 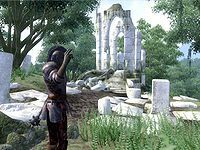 Modryn believes that Azani moved his base of operations to Atatar - a nearby Ayleid ruin. He suggests to search there and will lead the way himself. You can continue to explore Arpenia if you like, as Modryn will wait patiently for you, but apart from a few rats and Ayleid chests the place is empty. Follow Modryn to Atatar but do not fast travel or go ahead of him, because this may cause a bug. The location won't be marked on your map until you arrive and Modryn refuses to move unless you are close to him. Therefore, you must follow him. Once you're both inside, you may take the lead again. Explore the area, dispatching any bandits along the way and collecting three Varla stones, until you find Azani. Beware, he is a skilled nightblade and is very powerful, so make sure to be fully prepared for the battle (don't count on Modryn for much help). Azani will be wearing Elven armor even if you are of a low level. He also carries Sinweaver, a unique sword with Drain Fatigue and Fire Damage enchantments. Be sure to also take his ring, as it is required to complete the quest. 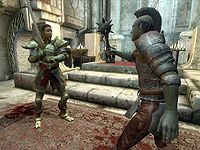 Speak with Modryn if you managed to keep him with you or return to the Chorrol Fighters Guild to speak with him. He'll need Blackheart's ring (which you found on his corpse) as proof that the killing was done by the Fighters Guild. In exchange you will gain one Fame point and once you speak with Modryn again, he will promote you to Warder. Following this quest you can either go to Burz gro-Khash in Cheydinhal to start The Fugitives or to Azzan in Anvil to start The Wandering Scholar. The order in which you do these following quests does not matter. Modryn Oreyn can be a useful follower while he is following you at the beginning of the quest and can help you to complete other quests. Blackheart's ring can be stolen from Modryn Oreyn before he leaves Atatar, however once he sets foot outside the ruins it disappears. The ring will remain in your inventory indefinitely as it is a quest item, and will always be flagged as stolen. It might be a good idea to grab Azani Blackheart's Elven armor, especially his cuirass, since this is the only place where an Elven cuirass can be found before level 15. Additionally, you will need one for the Light Armor master training quest, and it is difficult to find for at high levels. If you take Azani's ring immediately after killing him - before the quest updates saying he is dead - Modryn will not ask for it and the quest cannot be completed. You can get around this if Modryn has not yet entered Atatar. You will need to travel back to where he is (most likely on his way, walking from Arpenia) and let him enter Atatar (Note that he will not travel anywhere unless you are within five feet of him, so you must follow him all the way to Atatar). Once you are both inside, talk with him and he will ask you for the ring. You can then finish the quest. If you fast travel to Arpenia, Modryn may get lost. Simply wait for a few hours (or try fast-traveling to Leyawiin and back) and he should appear. If you enter Atatar without Modryn (before he gets there), he may not appear inside with you. This can be fixed by simply fast traveling back to Arpenia. The green arrow on the compass will lead you back to Modryn. However, if you wish to not walk with Modryn, the quest can still be completed solo by retrieving the ring, exiting Atatar, allowing Modryn to enter Atatar, and speaking to him. If you enter Atatar without Modryn (by fast travel), it is possible for the body of Azani Blackheart to disappear, making the quest impossible to finish, and thus halting all progress in the Fighters Guild. If you don't walk with Modryn to Atatar, he may constantly try to lead you there for the rest of the game. You can fix this by walking to Atatar and entering the dungeon with him. When you're in Arpenia, if you are too close to the ceiling spikes trap it is possible for Modryn to get stuck there. You will have to load a previously saved game or wait and see if he eventually walks out. In Arpenia, if you go to the area just by the first set of spikes, you can bypass searching the ruin entirely, as Modryn will speak to you immediately and tell you nothing's here. 5 Oreyn would like to speak more about duties, once I am promoted to the next rank. 10 I went to Modryn Oreyn to ask about duties, but he told me he had no "official" duties. However, he asked me to meet him at his house later tonight. 20 I met Modryn Oreyn at his house, as he requested. He told me a story about Azani Blackheart, Vitellus Donton's death, and the Blackwood Company's current involvement. He would like me to go with him now to find out what really happened. 30 I've told Oreyn that I will not accompany him in investigating how the Blackwood Company fulfilled the Azani Blackheart contract. 35 I am to meet Oreyn at the Fighters Guild in Leyawiin. From there, we will travel to Arpenia to look for Azani Blackheart. 40 We've searched the ruins of Arpenia, and the place is deserted. There are no corpses, no signs of battle. Oreyn believes that the entire story was made up by the Blackwood Company, that perhaps they paid off Azani Blackheart to move his base of operations. Oreyn suggests we search nearby Ayeleid [sic] ruins, and knows of one to the northeast. 50 Oreyn and I have found and defeated Azani Blackheart. 60 Oreyn wishes to make sure people know who truly defeated the great warrior, and recognize the lies of the Blackwood Company. Oreyn would like me to give him Azani Blackheart's Ring as proof of our accomplishments here today. 100 Finishes quest I have given the ring to Oreyn. This will allow him to prove that it was the Fighters Guild who finally defeated Azani Blackheart. It is possible to use the console to advance through the quest by entering setstage FGD05Oreyn stage, where stage is the number of the stage you wish to complete. It is not possible to un-complete (i.e. go back) quest stages. See SetStage for more information.